500 x 1 Ounce 2019 American Buffalo gold coins. 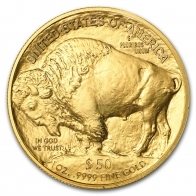 The gold Buffalo coin was the first coin ever produced by the United States Mint to contain 9999 fine gold bullion. Each monster box is sold containing 25 tubes of 20 coins each. Each coin comes sealed in plastic from the US Mint. The coin features an indian head on one side, with the image of an American Buffalo on the reverse. The year of production of the coin is located on the front, with the weight, fineness and face value located on the reverse. The American Buffalo coin has a face value of 50 USD. 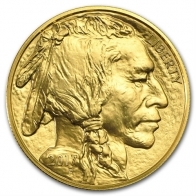 The American Buffalo gold coin is one of the few gold coins in ciruclation to contain 9999 fine investment grade gold bullion. The Canadian Maple Leaf gold coin also contains 9999 fine gold bullion. 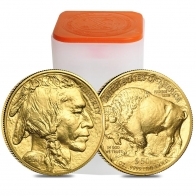 The gold Buffalo coin is currently only available as a 1 Ounce gold coin. The United States Mint also produce the American Eagle series of coins, which is available in gold, silver and platinum, and very popular with individuals looking to buy gold. 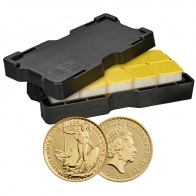 The 2019 gold American Buffalo coin is available to gold investors for VAT-free Swiss storage.